This evening at Occidental Park in Pioneer Square, the Seattle chapter of the worldwide Food Not Bombs movement once more shared, with homeless individuals and others and ourselves, donated food. 40-plus aid recipients enjoyed hot soup for no cost. The vegan, glutenfree meal contained cauliflower, carrots, beans, and more — perfectly good food that otherwise would have been thrown out by the donor restaurant. Guiding this action was the principle that quality food is a human right. Four volunteers had lots of fun implementing a better world. Two guys, two gals. We played guitar, sang, danced. Some discussed the possibility of going train hopping in the near future. Others petted the leashed cat a passerby randomly brought. Each week, creating a Food Not Bombs reality is probably my happiest time. Various aid recipients seemed really happy as well, especially when talking a bit. One guy said he might go to New Mexico soon, or Louisiana (he wasn’t sure), by bus I guess. Another told us the warmer weather was cheering them up. It seems when people have little, the food tastes better, ordinary things matter more. Lots of people are still lodged in the bombs life, wherein they’d much rather gaze upward at the death-dealing leaders to pick one of them to promote in their rivalrous battles with each other, but to those people I’d like to say, there’s still time for you to do something different. 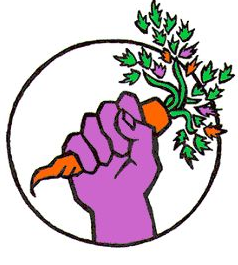 Find a Food Not Bombs chapter in your area or start one. Defect from bombs and make good food a human right! 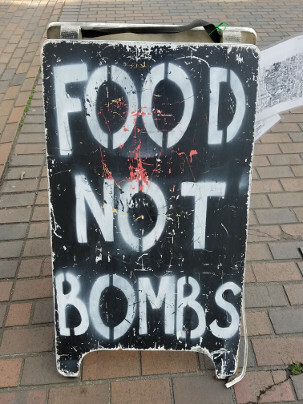 Seattle Food Not Bombs sharing report: 25 March 2018: Happy Defectors by Douglas Lucas is licensed under a Creative Commons Attribution-NonCommercial-ShareAlike 4.0 International License. It does not affect your fair use rights or my moral rights. You can view the full license (the legalese) here; you can view a human-readable summary of it here. To learn more about Creative Commons, read this article. License based on a work at www.douglaslucas.com. Seeking permissions beyond the scope of this license? Email me: dal@riseup.net. 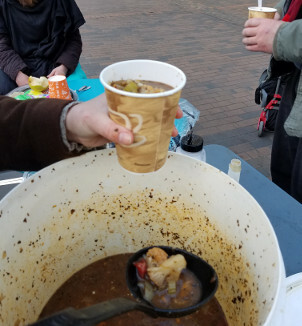 Today the Seattle chapter of the global Food Not Bombs movement shared donated food with homeless folks and other individuals, primarily at Occidental Park in Pioneer Square. It’s a direct action we take just about every Sunday, with the meal starting around 5:15 p.m. This evening, on a shoestring budget, three FNB participants made a tangible difference in many people’s lives, enjoyed great, bonding conversations, and propagated the straightforward message that food is good and bombs are not. Around 40 aid beneficiaries came to our setup, where we offered great grub. The hot soup, two large bucketfuls gifted by a local restaurant, was vegan and glutenfree. It included lentils, carrots, and corn. Also on offer: bread, fruit (mostly apples), and a sole fortune cookie someone donated on the spot. Food Not Bombs makes a point of offering food that’s generally high quality and healthy, and conveying allergen and other important information about the meals accurately. That’s crucial for our reputation as aid providers — so that recipients trust our food (word gets around) — and it’s significant because everyone, regardless of housing status, deserves to have their dietary requirements respected. It was heartwarming how just about every person who partook in the meal maintained an optimistic attitude, positive energy — despite poverty, lack of housing, or other troubles. I believe big goals are important in life, but the Zen people have something when they talk about the importance of enjoying the present moment. Sharing that meal, conversing with everyone, was a complete experience in itself. Insofar as metrics matter, well, without the officialdom, bureaucracy, fear, and hierarchy of the nonprofit industrial complex, we were able to feed some 50 people this evening for nearly no monetary cost, while many others are waiting for permission to act. Personally, I’ve been much happier providing direct aid as part of a community than I have been doing ‘serious’ journalism paid-work for hierarchical nonprofits. Food Not Bombs has been a great learning experience for me; I bet it would be for many of you as well. We bring to the park a big sign that says FOOD NOT BOMBS, to open the door for our message without hitting hungry people over the head by proselytizing. It’s a really simple idea, that instead of spending trillions of dollars bombing people, we could cook for each other. It looks like creepy predator Joe Biden may run for president in 2020. Don’t beg him or destructive Trump to make food a human right, they don’t care, and you know better than to trust corporate television such as MSNBC or Fox — do it yourself. Find a Food Not Bombs chapter in your area or follow these steps to start one. Quick note: you don’t necessarily have to do this at a park. Once people finished coming to our tables, we drove the remaining soup and other items around to some tent encampments with hungry individuals and gave out food that way. Corporations teach you to fear people without houses, but these individuals are just people without houses, you can still interact with them, they’re human as you are and you may be homeless next, assuming you’re not already! Next time I do a sharing report I’ll try to provide more details and some photos. And no, I didn’t forget the Chekov’s gun above. One of the homeless folks opened up the fortune cookie, and his message was: Good luck will soon come your way. Seattle Food Not Bombs sharing report: 4 March 2018: Fortune Cookie by Douglas Lucas is licensed under a Creative Commons Attribution-NonCommercial-ShareAlike 4.0 International License. It does not affect your fair use rights or my moral rights. You can view the full license (the legalese) here; you can view a human-readable summary of it here. To learn more about Creative Commons, read this article. License based on a work at www.douglaslucas.com. Seeking permissions beyond the scope of this license? Email me: dal@riseup.net.